LondonScape As A Human Brain. Suggesting that we create something like the Tree of Souls from the film Avatar may sound a little flippant. What would it really mean? When we held some roundtable discussions about LondonScape one of the things that became clear as being unknown was how awareness of our collective mood, or being more aware of our interconnections, might effect us. In essence some of what we want to do through LondonScape is make what was previously non-conscious brought to a level of awareness. This led us to reflect on what consciousness even is. If we take the concept of LondonScape and the idea of collective consciousness back to a single human being for a moment…..
Consciousness: it’s a word that combines richness, complexity and wonder but that can be simplified in to a three-part system: we perceive, process and behave. perceive the world through our senses, both internally and externally, in order to collect information. evaluate the information we gather based on our genetics and conditioning. behave in response to our perception and evaluation of information. Self, identity and personality are not things, they are biological processes built within the brain from numerous interactive components, step by step, over a period of time. They are like an ongoing performance and as such are subject to variation and highlight how the human self has many levels. There is the protoself level that corresponds to a gathering of information regarding the state of the body. It is constructed in the brain stem and it generates feelings that signify our existence, therefore in its absence one cannot be conscious. The next level, the core self, is also indispensable for consciousness. It exists through an interaction between our brain and an object, when there is dialogue between two parts, like the brain stem and cerebral cortex. It creates a sense of the "here and now", devoid of historical perspective. It's like a consciousness of the moment. The third level, the autobiographical self, creates the more or less coherent picture of our history, a narrative with a lived past and an anticipated future. The narrative is composed of real and imaginary events, and from past interpretations and re-interpretations of events. Identity emerges from the autobiographical self. This is where I imagine neuroscience could link back to LondonScape. The autobiographical self is not just about one person but about all the others that a person interacts with. It incorporates the culture in which the interactions took place and contains multitudes ― other people, other places and requires the brain to draw on the partnerships between varied parts of the cerebral cortex and the brain stem. This process is ongoing and incredibly complex. It branches and loops back to the beginning constantly. The brain manages to put a spectacular combination of images together in the same way that I hope LondonScape can link a whole combination of data sets together. Poet Fernando Pessoa (I'd recommend his writings) says that each of us is "many". He describes it as “ I can only recognize myself as symphony" and I love this description for evoking the astonishing complexity of a brain engaged in producing the symphonic results we call the conscious mind. The symphonic result is easily recognizable but the brain instruments behind it have been elusive and are only now being understood and highlighted by neuroscience research. Similarly, finding the instruments and infrastructure required for data provenance, as well as learning how we’re shaped by data as more of it is generated, opened and linked, is an ongoing process of discovery. I hope to keep connecting LondonScape with neuroscience as we develop the project, as by understanding the essential elements of the system governing each of us individually I also hope we can begin to understand more about our collective state. One of the challenges of LondonScape has been, and will be, communicating it's value. Working in a world that increasingly needs to think about resource allocation versus social impact, LondonScape cannot simply be an 'art' project but instead is positioning itself as a public value project. Improving data literacy is one of the intentions of LondonScape and we can define quite clear outcomes and impact in relation to that, but trying to articulate, let alone measure, things like entanglement and interconnection is no easy task. Interconnectedness is at the heart of the project though. It requires that we take responsibility for noticing how we affect other people, that we realise how our behaviours and choices impact others, even at a distance. Most cultures have words and concepts to describe it though in the Western world it's become rather lost in our drive for individualism. In South Africa the word is ubuntu - a word too rich and complex to be translated in to English. Desmond Tutu describes it: "it means my humanity is caught up, is inextricably bound up, in yours. We belong in a bundle of life. We say a person is a person through other people." So LondonScape wants to discover if data can help us see the world as a series of complex interactions and to look for multiple causes and conditions rather than just one. Part of this will require us to measure what's resulted from the process and outcome of interconnecting rather than the study of isolated parts. The DataStore had its first few outings in the last fortnight. In the first instance we set up aspects of the DataStore in the Sackler Centre at the V&A Museum. This was part of the Digital Futures:Urban Open Space alongside NASA and other winning teams from the Urban Prototyping Festival. Although the event was open to the public and many people visited over the two days, one of the main reasons for the event was also for participants to meet, share work and start new collaborations. Over 2 days we had over 200 people in to the space, with over 60 of those people filling in insight cards for our DataBank (see image below). We spoke with people as young as 8 about data and their understanding of it, as well as with very experienced technologists and data scientists. We'll be writing a separate blog post shortly on what the findings were from that. The following week, after a whirlwind 3 weeks of design, manufacture and logistics we set ourselves down on our designated site on Old Street, at the junction with Great Eastern Street in Shoreditch. As a winner of the Urban Prototyping Festival we found ourselves at the Shoreditch Digital Festival. The first iteration of the DataStore was crafted from steel, looking sleek against the backdrop of the urban environment. Individually designed Data Jars which tell the story of different types of data - we'd sourced a number of use cases from health, retail, civic society, government, and finance - each label on a jar told the story of how data had been collected and how it had been useful. The DataBank, to gather insight and feedback. Unfortunately on the day the good ol' British weather let us down - it rained all morning and afternoon! None-the-less we wrapped up in warm clothes and wellies and had conversations with passers-by about public and personal data. The DataTrails animation was a great way of introducing the concept to people and the DataJars were definitely a way in to talking with people about data. People wanted to come and pick them up and see what was inside. We found a number of people were skeptical about sharing their personal data, but if they could feel more in control of it and could more clearly see the benefit to them and others they would be more likely to share. People knew less about public/ civic data and it was a reminder how there needs to be more (and better) communication of case studies to the general public about how and where data has been opened/linked/shared etc. Having just returned from Helsinki Design Lab's closing event and hearing @timoarnall from Berg talk about nearfield.org I was reminded of the importance of us understanding the technology that tracks us and how the DataStore, especially the DataJars, is a mixture of realities and representations. It has the potential to facilitate "a reflective conversation with materials." Click through the images below for our gallery of photos. Thank you again to all our supporters and sponsors. As part of DataStore we commissioned a short animated film, called DataTrails. The brief we gave them is below.
" As citizens in an increasingly digital world, data surrounds us and connects us to data and to people: friends, associates, or people we don’t even know or tangentially know. Connectivity and open data are the “big infrastructures” of the information age. In a single day the average person is exposed to the same amount of information as a person in the 15th century was exposed to in a lifetime. Every second, you receive and process over 11M bits of data from your five senses. 230 million tweets a day. Today, we continue to generate data consciously, from every item we purchase, to medical records from a visit to the doctor, to Internet searches and interactions with social networks. All of this data is captured and recorded with our implicit or explicit knowledge. However, data is also generated unconsciously, without our knowledge, as we move through the world and live our increasingly digital lives. Mobile phones generate location data, and our cars generate location data and diagnostic data. In our own homes, smart meters generate data about when we heat and cool our homes, or do our washing. Sensors like GPS in cars and mobile phones, mobile towers, and smart electric meters generate data without a direct action, other than living our day-to-day lives. If we look outside our own walls, at all the social data and public data sets that are being generated around us, we can integrate and process our data amongst other peoples', allowing the discovery of new insights from our own data. All kinds of potential open ups in terms of creating more value for ourselves as well as for civic society." And the brilliant Yarn in Berlin, delivered us the film below. It's a short film because turnaround time was tight but we think it does a great job of conveying the concept of how we generate data all of the time. On Tuesday 28th May we will be setting up the first ever DataStore as part of the Shoreditch Digital Festival. We'll be on Old Street, on the huge bit of paving that intersects where Old Street and Commercial Street meet. Starting at 9am we will spend the day open to the public, hoping to engage passers by in a discussion about data, personal and public data, open data, linked data and what it means to be data literate. Luckily we'll have some data scientists and experts joining us on the day, including Adriana Lukas and Ulrich Atz. There is more information about DataStore here. We hope to see you on Monday and in the meantime, would like to say thank you to Urban Prototyping Festival who awarded us with the Urban Resilience prize and therefore made it possible to bring the first version of DataStore to life. We are also excited to announce that Intel have come on board as partners for our next version which will be heading off to the States and France later in the year, and which will include more creative technology elements. And other thanks to Nicky Wilkinson, David Saxby and Duncan Wilson. 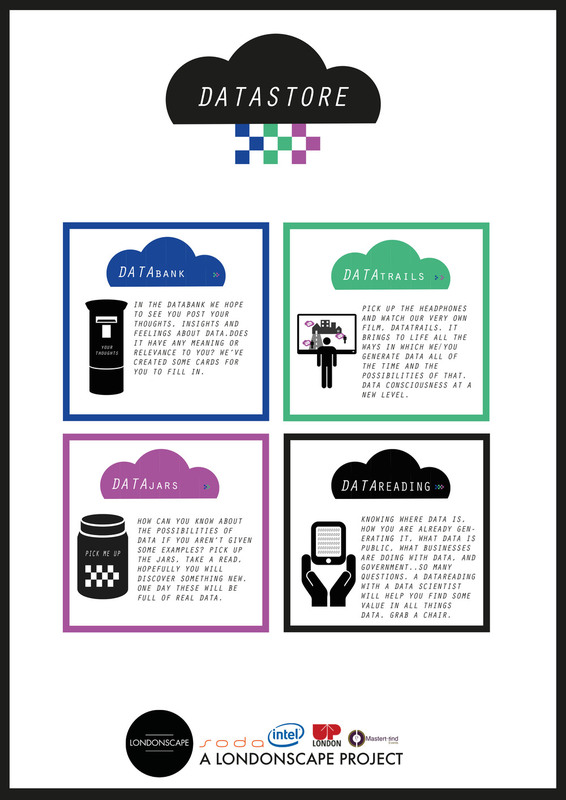 The poster below shows what is included in DataStore part 1. Above is an image of the 'Tree of Souls' from the movie Avatar - its roots connect all living being, and the planet itself, in a network that keeps track of the health of the system and acts as a knowledge repository. This was the inspiration and starting point for LondonScape and is the ambition for what we want to create in the long term. For now, we're starting at a test site in partnership with Westminster Council that will explore data empathy.